I remember way back in 1972, February 1972 actually, the US government held a Lottery for the drafting of men to fight in Vietnam. My number that year was 312. My older brother, born 4 years earlier, also received the number 312 during his Lottery. November 8th, 1953 and April 8th, 1948, we both drew the same lottery number of 312. When I think back on those times in our history it is hard to fathom the reality of a Draft. Sadly, not everyone was as lucky as my brother and myself. We were never called to serve, though many of our friends were. In the months leading up to February 2nd, 1972, I became a chain smoker. That lasted until April 1992. If a young 19-year-old could become a chain smoker just by worrying about a lottery drawing, imagine the stress and anxiety of those that were drafted. Today we live in a very different world. The draft was eliminated decades ago, but millions of young men and women heard the call in the years since and joined the service to protect the United States. How can you not be proud of every single individual who would put aside their own safety, security, and selfishness to become something larger than themselves, to become a member of the United States Military? The fact is, the US military is always off fighting in some part of the world, or at least it seems like it. Every day men and women are putting their lives on the line, sometimes for the protection of every US citizen, and sometimes to fight injustice, or evil, for people that can’t fight back. So many never return. We owe our brave soldiers everything, and if I had my way, our soldiers would never have to worry about food, shelter, or health, ever again. But we know that won’t happen; our brave men and women face many challenges while serving in the military, and afterwards, only to be greeted by the harsh reality of living in modern times. 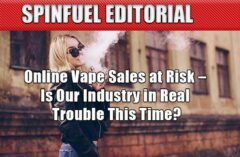 My job as the publisher of Spinfuel eMagazine, a global online magazine for people that use electronic cigarettes, brings me into contact with men and women who have already fought our wars and who are currently fighting our wars, and they always receive the utmost respect and admiration for the job they do. I meet many of them because of the number of soldiers and ex-military personnel that have switched from smoking tobacco cigarettes to vaping electronic cigarettes grows every day. I meet them at Vaping Expos, conventions, and even around town. Spinfuel, and myself personally, try to help as much as we can, sometimes by giving away free products, and sometimes by just informing them about which products are good and which one they should avoid. Every time I can give a veteran or an active soldier a starter kit or a few bottles of e liquid, it makes me feel better about not having had the bravery they have in abundance. There have been hundreds of surveys and studies that continue to show that the number of active smokers is considerably higher among our veterans and current soldiers, when compared to the civilian population. From 2007 to 2010 veterans aged 25-64, 29% were actively smoking cigarettes. The civilian population in the same age group was 24%. Worse still, in 2011 the percentage of veterans still smoking was 24% and the civilian population had dropped to just 19%. These numbers don’t even consider the number of active soldiers that currently smoke tobacco products. Outside the military, smokers were finding their way to the less harmful electronic cigarette, but inside the military people weren’t following suit. Today, while we don’t yet have accurate numbers, the disparity between smokers and vapers, in the military and in the civilian population, is most certainly greater than it was back in 2011. Vaping has become a household word, and millions of people in the US alone have learned just how safe vaping can be. I’ve met and become friends with many people that are former military who have come home from the fighting with PTSD. Fighting a war takes a toll on every soldier, and it also costs our government a tremendous amount of money ever year to treat our good men and women who heard to the call to serve. Billions of dollars are spent every year on treating medical issues for veterans, but its not enough. Did you know that the cost for caring for our soldiers that smoke tobacco products cost hundreds of millions of dollars every year? Whether its PTSD or a bad habit picked up because of stress or boredom, smoking is a big problem for the individual soldier/veteran, and for the government that tries to care for them. Thankfully, a much safer alternative to smoking is making headway into the world of veterans and active soldiers. 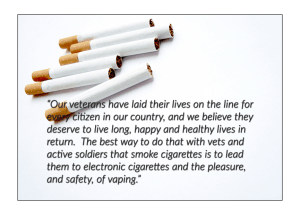 Many tens of thousands of our brave soldiers, both current and former, have switched to e-cigarettes, an infinitely less harmful way to smoke (we call it vaping), to stave off the ravages of smoking. We know this because thousands of our military personnel have come to depend on Spinfuel to bring them honest reviews and news for vaping products, so that they can make sure that every hard earned dollar is spent wisely. We at Spinfuel eMagazine take this responsibility very seriously. Look, there are many valid reasons why the use of tobacco and marijuana smoking is much more common in military than it is elsewhere. The stress our soldiers feel, day in and day out, is enormous. The responsibility of protecting this great country alone is enough to drive brave men and women to seek out ways to relieve this stress. But in the end, soldiers that use tobacco products and/or marijuana wind up suffering for it. There are hundreds of reasons why tobacco kills, and I don’t want to turn this into a book-length article outlining them all. We all know tobacco causes cancer, heart disease, strokes, and much more. I wonder how many people understand the harm that comes from simple combustion? The dangers of tobacco products and marijuana also comes from the fact that, before vaporizers, the only way to consume them was through burning them and inhaling the smoke emitted from the leaves. Using a vaporizer, or e-cigarette, vapor is created by heating a liquid, and that alone makes a big difference. Even though smokers today understand all too well the perils of smoking, quitting is one of the hardest issues they will ever face. According to American Lung Association, 77% of smokers fail when they try to quit. Do you doubt that this percentage is certainly higher among our veterans and our active soldiers? According to CDC, smoking has caused ten times more deaths than all the US wars… combined. There are several organizations that are trying to make a difference in the lives of our veterans and current soldiers, many of them directed at one common problem, medical issues from smoking. The solution to this supposedly insurmountable problem is working with veterans and active soldiers who remain addicted to smoking is to lead them through that addiction to an infinitely safer alternative… vaping. The fact is, using electronic cigarettes is unquestionably safer than using tobacco products. Study after study reveal real science behind the claim that using e-cigarettes are much safer than smoking. When a person uses Electronic cigarettes they exhale vapor, not smoke. Vapor that has NO toxic effect on the cells found in human lungs. Current research funded by British American Tobacco suggest inhaling nicotine vapor could be as safe as breathing air. Experiments were conducted in this particular study was conducted with the MatTek Corporation, a company that makes models of human cells used in ‘in vitro‘ laboratory experiments. Scientists used a “smoking robot” to expose lung cell replicas to tobacco smoke, the vapor from two different brands of e-cigs and simple unadulterated air. When exposed to tobacco smoke for six hours, the cells died. 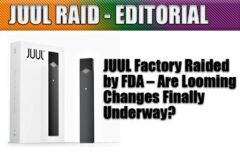 But after subjecting the cells to an “aggressive and continuous” dose of vapor, researchers claimed the damage to the airway tissue was “similar to that of air“. By employing a combination of the smoking robot and a lab-based test using respiratory tissue, it was possible to demonstrate the e-cigarette aerosols used in the study had no [toxic] effect on human airway tissue, according to the BAT spokesperson Dr. Marina Murphy. Since that time hundreds of studies have shown similar findings, and as hard as anti-vaping organizations fight, the truth wills out. Vaping with electronic cigarettes are indeed, infinitely safer than smoking. Our veterans have laid their lives on the line for every citizen in our country, and we believe they deserve to live long, happy and healthy lives in return. 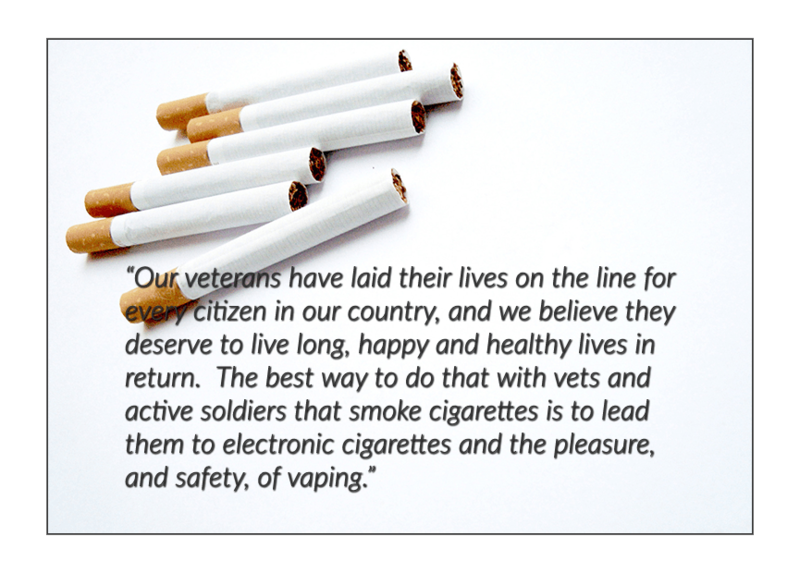 The best way to do that with vets and active soldiers that smoke cigarettes is to lead them to electronic cigarettes and the pleasure, and safety, of vaping. Companies that we work with, including MigVapor, believe like us, that we owe our veterans more than we can ever repay, and it is our duty to help them in any way we can. MigVapor offers every vet and active soldier a 10% discount on ALL their products (just enter the code “veteran”). Spinfuel eMagazine runs giveaways constantly, and we will soon begin to offer exclusive giveaways to veterans and active soldiers so that they have a chance to experience the best alternative to smoking.